With February fast approaching, I have been musing over what to do for Valentine’s Day. 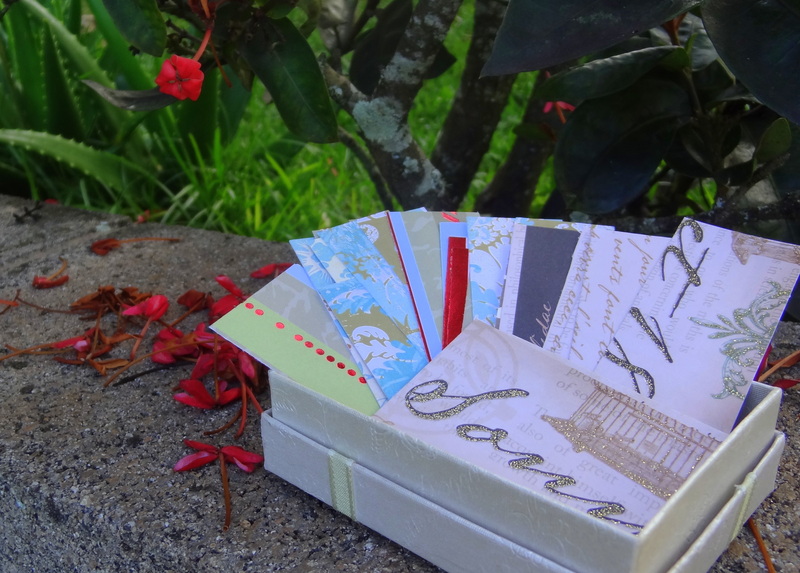 I adore creating homemade cards and baking sweet treats, but this year I was inspired to do something more. It is the month to tell those we hold dear we care, give an extra smile, another squeeze! But that had me thinking, do we do this enough for ourselves? 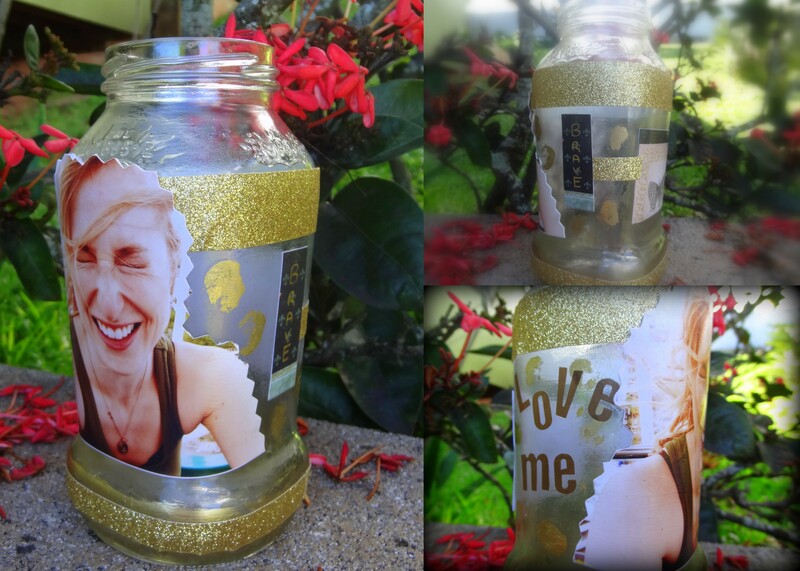 For this upcoming month I have created a Love ME Jar. This simple DIY craft came together in just under an hour, and will be giving back to me all month long. A large glass jar, rinsed and cleaned. I frequently save our glass jars, so the ones pictured are from pasta sauce! An assortment of decorative scrap paper, stick on letters, stickers, glitter, whatever makes you happy. 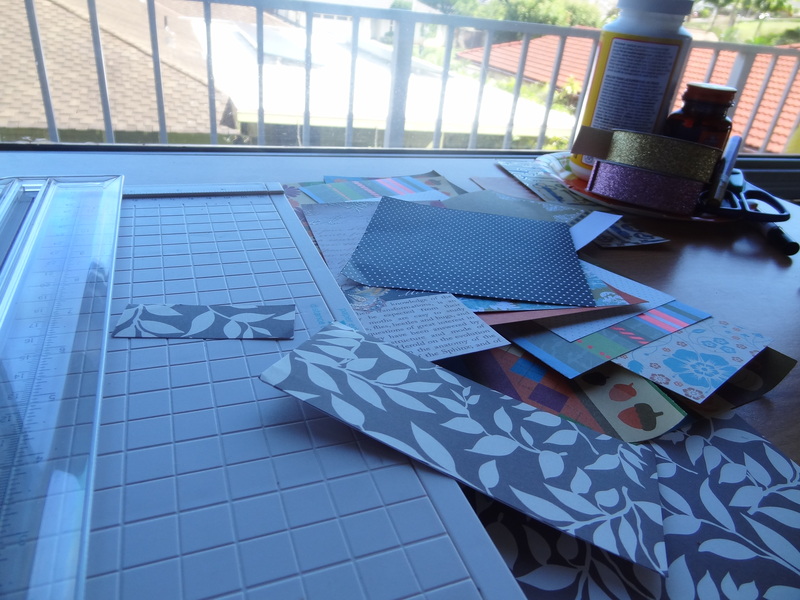 Crafter’s Choice: A personal photo. I chose to put a photo on the jar for me, the one I selected was snapped at a wonderful moment and always makes me smile;) The second jar I made for a friend does not have a photo. Step 1: If you choose to mount a photo on your jar, I suggest backing it with pretty paper. This way once it is on the jar you can look through the jar and still see something lovely. 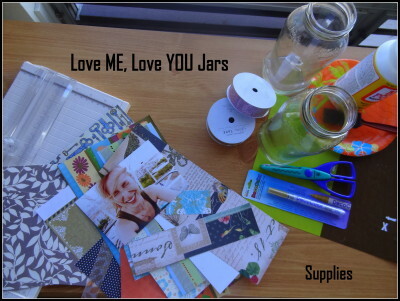 Step 2: Apply a thin coat of Mod Podge to the outside of the jar and to your photo with the foam brush. 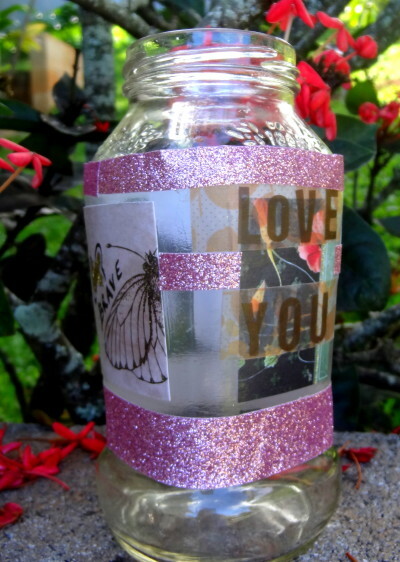 Then stick the image to the jar and coat over it thinly with more Mod Podge, almost like you are painting over it. Hold it in place (you will get a little messy!) and it should seal down nicely. 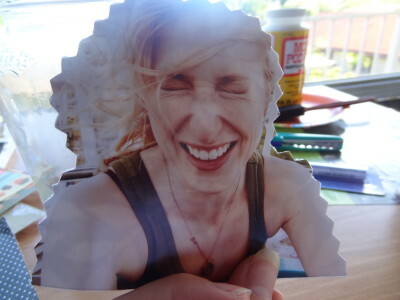 Repeat with any other images or paper you have, and give everything a nice seal of Mod Podge over the top. Step 3: Cut strips and squares out of your decorative paper. I was not specific, I just snipped away until I had 28 pieces. 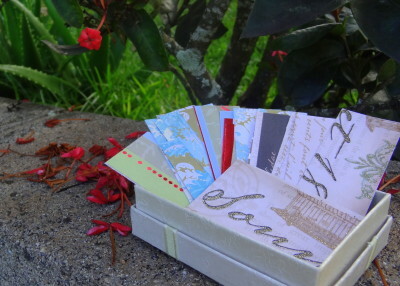 Step 4: There are 28 days in February, and I intend to write a special note to myself each day. It can be something I enjoyed about my day, or perhaps a thankful thought. It will be positive, and loving, and when I am all through, February will be finished and I’ll have a collection of little Love Notes to ME, from ME! If you want a spin on this project, it can make a great gift idea too! 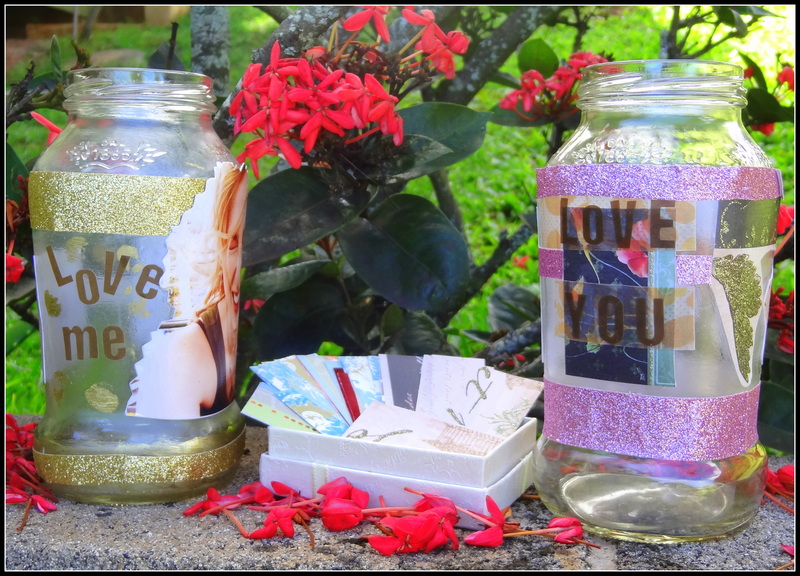 I created a Love YOU jar for one of my best friends. I intend to give it to her in hopes she will join in my journey and compose 28 great thoughts for herself in this upcoming month of love! You could also already fill the jar with things you love about that special person in your life! The possibilities are endless. A little bit of jarred joy. What an awesome idea! You have inspired me to try it as well!